This new painting is special to me for several reasons. For starters, I really like it! I always enjoy the process of painting and trying to solve the design problem, but sometimes the end result falls short of what I am trying to achieve. Ironically I believe this is a motivating factor to paint and to try it again. But this time I am happy with the look and feel of this painting; the spontaneity and lightness. Acrylic Painting ©Flora Doehler, 2019, 36×48. However, creating this painting has other significances for me. It’s wrapped in the dream of moving to Nova Scotia 12 years ago. 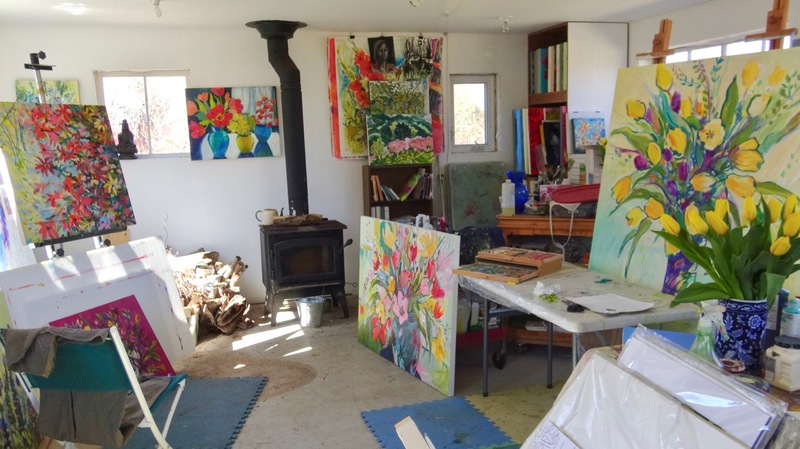 It’s about the mutual inspiration that artists share, and it’s also about my gratitude in having my own big, beautiful studio where I can work on larger paintings, even more than one at a time. 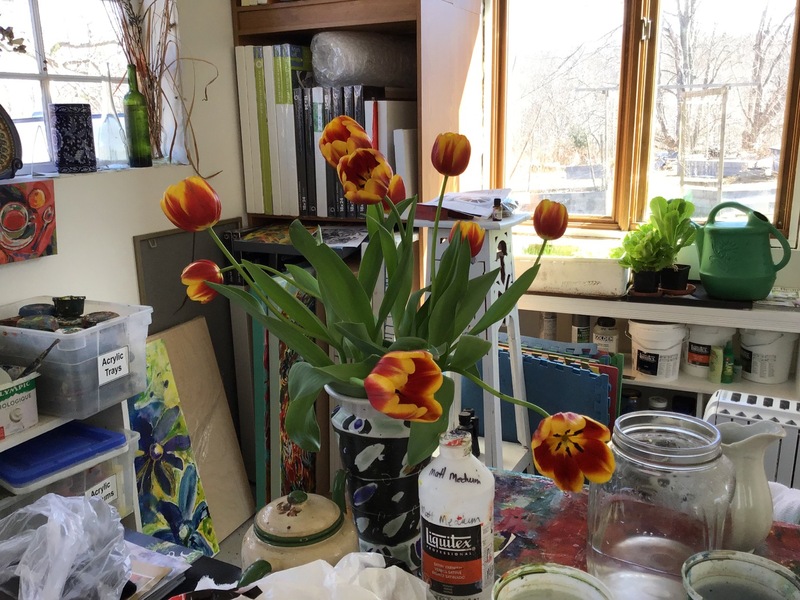 The vase in the painting is inspired by a big beautiful pot made by Ray Mackie and decorated by his wife Deb Kuzyk at Lucky Rabbit, Annapolis Royal. 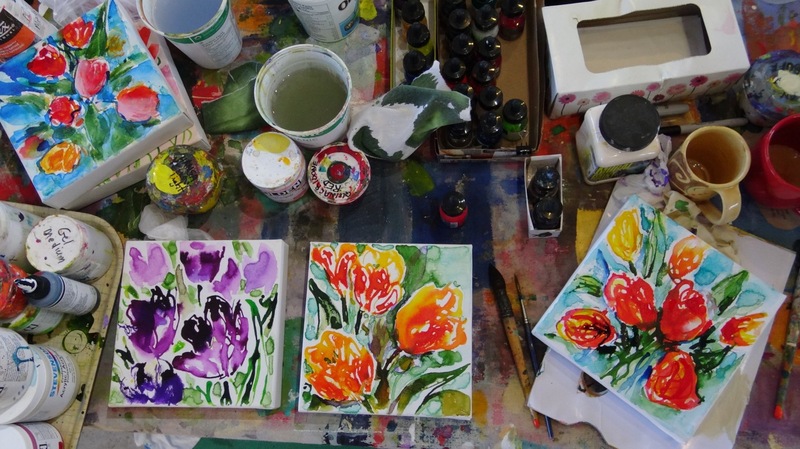 Deb Kuzyk paints the Nuthatch and Peony vase before firing. Little did I know that a time would come when Deb and I would be friends and that she would agree to trade one of her beautifully painted pots for one of my paintings. 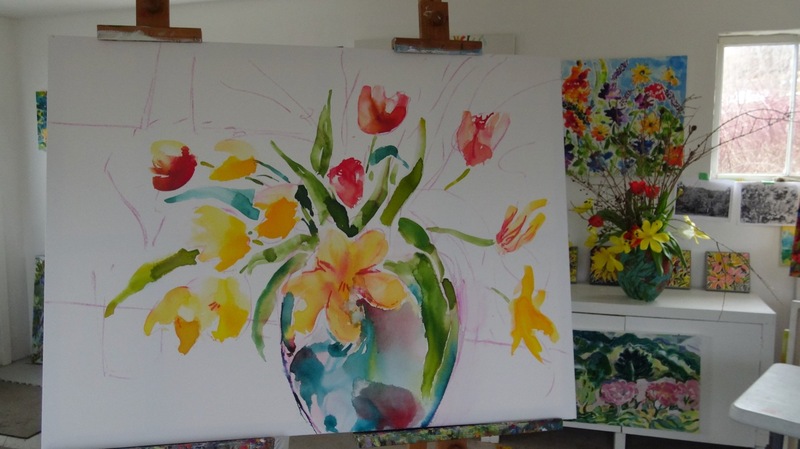 Deb’s use of loose, fluid line-drawing on her Nuthatch and Peony vase inspired my approach to this painting. And apparently, that inspiration went both ways. My peonies painting that Deb chose influenced the way she approached decorating this pot. I love this serendipity! The vase is a generous size and forced me to create an abundant bouquet – not easy to do around here in February. I brought some of its turquoise into my painting and its lovely, round shape. Variations of it will, for sure, make way into many future paintings. Larry and I shared the studio for 10 years but this fall we both realized we needed more space for our ever growing creative pursuits. He has his own space now where he can letter signs as well as continue making jewellery. Have two easels set up at a time. I like to let a painting ‘rest’ and change my focus. Then when I return to the painting I’m not working on, I get a ‘fresh’ view. I have everything I need, even rain water for washing out brushes. Unlike writer George Bernard Shaw, I don’t even need a rotating studio to follow the sun because I have windows on four sides. George Bernard Shaw’s, writing shed was positioned on a turntable to follow the sun. So hooray for generous studio space! Virginia Woolf had it right. PS: This following video is a little talk by moi about the painting process. You can see the changes from 6 weeks ago to today. Hello Flora, Here I am watching/reading this from Chiang Mai where it is very, very hot and high pollution. Thank you for preparing/inspiring me to return to NS. I really like the video which gives me glimpse of the artist, teaching me to look at the paintings and ofcourse to see the finished paintings. Thanks for sharing and looking forward to see more of your paintings. Thanks Toi! It’s sunny here and Spring is actually coming, but there is still a chill. Some tips of plants are hovering at ground level waiting for a couple of weeks. I’m glad you enjoyed my video. Bring some of that Thai heat with you please! Spectacular!!! It feels springy without being overly sweet. Congratulations! Thank you Nancy! I think the cold weather brought out the warm colours. More to come! light — and the ability to walk around and work at your own pace. Beautiful work. Drink a toast in each of your studios for Steven and me. We’d raise a glass with you if we were there.